I want to show my study sites (15 from different countries) using a global map in ArcGIS Desktop. I'd like to show latitudes and longitudes (perhaps with a map grid). Is there a way to drop pins to show locations, or at least include map grid? 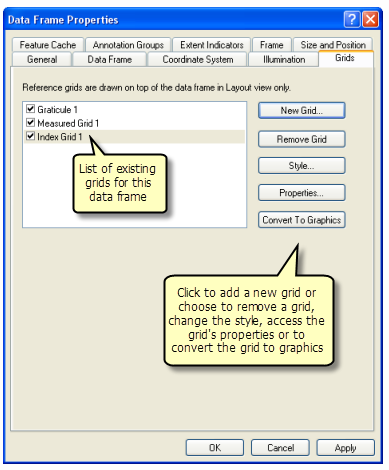 If wizards are enabled, the Grids and Graticules Wizard in the Data Frame Properties > Grids Tab allows you to set up map grids in an layout. In the wizard, choose the graticule option if you want to display lines of latitude and longitude (parallels and meridians). 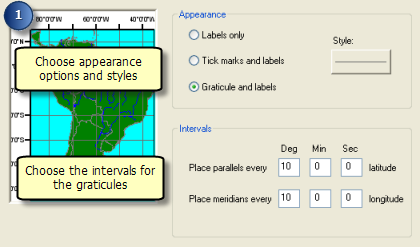 You can choose the type of graticule that you want, change the appearance, symbols, etc. It is also possible to display only markers (point symbols) at the intersections of the grid lines by choosing the "Tick marks and labels" option in the wizard. Appearance options are also available anytime by clicking the "Properties" button in the Data Frame Properties. Not the answer you're looking for? Browse other questions tagged arcgis-desktop grids-graticules geolocation or ask your own question. How to create a Winkel-Tripel map of countries with different colors? Using customized Coordinate System in ArcGIS Desktop? Using grayed out distance/direction tool in ArcGIS for Desktop? Delimiting service area for electric network using ArcGIS for Desktop? Making species map using km grid in ArcGIS Desktop?